Abbasid (Arabic: العبّاسدين al-ʿAbbāsidīn) was the dynastic name generally given to the caliphs of Baghdad, the second of the two great Sunni dynasties of the Muslim empire, that overthrew the Umayyad caliphs. It seized power in 750, when it finally defeated the Umayyads in battle, and flourished for two centuries, but slowly went into decline with the rise to power of the Turkish army they had created, the Mamluks. Their claim to power was finally ended in 1258, when Hulagu Khan, the Mongol general, sacked Baghdad. They continued to claim authority in religious matters from their base in Egypt where the Mamluk Sultans maintained them as titular Caliph. In 1517, the last Abbasid is said to have ceded the title to the Ottoman Sultan. Traces of the Abbasid dynasty can still be found in modern day Iraq, Kuwait, and in northern areas of Pakistan. From the eighth until the thirteenth century and in some form until the sixteenth century, the Abbasid dynasty represented the unity and preservation of Islam as a religious faith and as a social and political system. During this period, the ascendancy of what Muslims consider to be divine law over and above all human forms of government was firmly established and that legal tradition was itself codified. There was often, in practice, a struggle for power between the temporal leader and the religious scholars who claimed the right to interpret the law but essentially a sense of unity and a common code of conduct stretched across a vast territory. Muslims wherever they lived shared a worldview in common and understood the purpose of life as to please and serve God. The early Abbasids placed Islam back at the center of their administration, in contrast to their predecessors who had treated the Caliphate as a personal empire. Thus, the Abbasids played an invaluable role in reinvigorating the Islamic ideal that the whole of human life stands under divine guidance and that spiritual and temporal aspects must be integrated, not separated. Although towards the end of their Caliphate, use of reason in Islamic discourse had become suspect, the earlier flowering of learning Muslim scholars imbued all areas of knowledge with religious values, arguing that knowledge must always serve a higher purpose. The Abbasid caliphs officially based their claim to the Caliphate on their descent from Abbas ibn Abd al-Muttalib (566-652), one of the youngest uncles of the Prophet Muhammad P.B.U.H., by virtue of which descent they regarded themselves as the rightful heirs of the Prophet as opposed to the Umayyads. The Umayyads were descended from Umayya, and were a clan separate from Muhammad's in the Quraish tribe. Their forebear, Abu Sufyan, had been Muhammad's bitter foe, although he did become a Muslim. The Abbasids also distinguished themselves from the Umayyads by attacking their secularism, moral character, and administration in general. The Abbasids also appealed to non-Arab Muslims, known as ‘‘mawali,’’ who remained outside the kinship-based society of Arab culture and were at best second-class citizens within the Umayyad empire. Muhammad ibn Ali, a great-grandson of Abbas, began to campaign for the return of power to the family of the Prophet, the Hashimites, in Persia during the reign of Umar II, Muhammad ibn Ali. During the reign of Marwan II this opposition culminated in the rebellion of Ibrahim the Imam, the fourth in descent from Abbas, who, supported by the province of Khorasan, achieved considerable successes, but was captured in 747 and died in prison (as some hold, assassinated). The quarrel was taken up by his brother Abdallah, known by the name of Abu al-'Abbas as-Saffah, who, after a decisive victory on the Greater Zab River in 750, finally crushed the Umayyads and was proclaimed Caliph. Accusing the Umayyads of ruling the Islamic territory as emperors rather than as deputies of the Prophet of Islam, the Abbasids claimed religious legitimacy for their revolt and went into battle with the cry, “O Muhammad, helped of God.” They later wore Muhammad's mantle while leaving Friday prayers as a sign of their loyalty to his tradition. The Abbasids may have promised their supporters that they would restore the original process by which the “best among” the Muslims would be selected as Caliph and abolish the dynastic system. They may also have hoped to reconcile Sunni and Shi'a Islam by asserting that their family link to Muhammad through a male uncle was more legitimate than that of Ali's descendants, who traced themselves through Fatimah. The Abbasids rejected the rival claims of the Fatimids of Egypt on the basis that the Caliphate could not be transmitted through women. The revolt of the Abbasids against the Umayyads is one of only a few rebellions against a governing Caliph that has had majority support in Islam. Generally, Muslims have thought it better to obey even a corrupt Caliph provided that he is at least externally pious, for the sake of the unity of the community. Both selecting and removing a Caliph are matters of deep concern, though much of the literature focuses more on the qualities required of the Caliph than on the processes of appointing or dismissal. The Abbasids had depended heavily on the support of Persians in their overthrow of the Umayyads. Abu al-'Abbas' successor, al-Mansur, moved their capital from Damascus to the new city of Baghdad and welcomed non-Arab Muslims to their court. While this helped integrate Arab and Persian cultures, it alienated many of their Arab supporters, particularly the Khorasanian Arabs who had supported them in their battles against the Umayyads. The Abbasids also found themselves at odds with the Shias, many of whom had supported their war against the Umayyads, since as noted above the Abbasids claimed legitimacy by their familial connection to Muhammad. Once in power, the Abbasids embraced Sunni Islam and disavowed any support for Shi'a beliefs. That led to numerous conflicts, culminating in an uprising in Mecca in 786, followed by widespread bloodshed and the flight of many Shi'a to the Maghreb, where the survivors established the Idrisid kingdom. Shortly thereafter Berber Kharijites set up an independent state in North Africa in 801. At the same time the Abbasids faced challenges closer to home. The Byzantine Empire was fighting Abbasid rule in Syria and Anatolia. Former supporters of the Abbasids had broken away to create a separate kingdom around Khorosan in northern Persia. Harun al-Rashid (786-809) added to these troubles by turning on the Barmakids, the Persian family that had supplied the Caliphate with competent administrators, over a personal dispute. Faced with these challenges from within, the Abbasids decided to create an army loyal only to their Caliphate, drawn mostly from Turkish slaves, known as Mamluks, with some Slavs and Berbers participating as well. This force, created in the reign of al-Ma'mun (813-833), and his brother and successor al-Mu'tasim (833-842), prevented the further disintegration of the empire. It also, however, led to the ultimate eclipse of Abbasid rule. The creation of this foreign army and al-Mu'tasim's transfer of the capital from Baghdad to Samarra created a division between the Caliphate and the peoples they claimed to rule. In addition, the power of the Mamluks steadily grew until al-Radi (934-941) was constrained to hand over most of the royal functions to Mahommed bin Raik. In the following years the Buyids, who were Shi'ites, seized power over Baghdad, ruling central Iraq for more than a century before being overthrown by the Seljuq Turks. In the same period, the Hamdanids, another Shi'ite dynasty, came to power in northern Iraq, leading to a tremendous expansion of Shi'a influence. In the process, the Abbasid caliphs became no more than figureheads. However, they continued to confer certificate of legitimacy, and titles, on the Sultans (whose power was in theory delegated to them by the Caliph) and the oath of loyalty to them was recited during Friday prayers. Copying from the practice of the Shahs of Persia, the Abbasids started to receive visitors behind a veil (hijab) and to surround their office with mystique. As their temporal authority declined, this mystique increased. 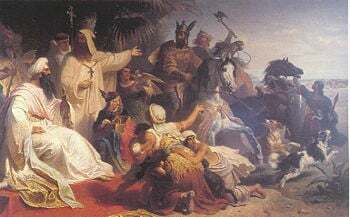 Julian Köchert's painting of Harun al-Rashid receiving the delegation of Charlemagne demonstrates diplomatic contacts between their respective domains. The reigns of Harun al-Rashid (786-809) and his successors fostered an age of great intellectual achievement. This era is known as the Golden Age of Islamic civilization. Baghdad was known as the City of Peace. In large part this was the result of the schismatic forces that had undermined the Umayyad regime, which relied on the assertion of the superiority of Arab culture as part of its claim to legitimacy, and the Abbasids' welcoming of support from non-Arab Muslims. The popular Arabian Nights is set in the reign of Harun al-Rashid, and tells us something about what life was like for people during this period. In this story, women as well as men take the initiative and some suggest that the text represents a feminist alternative to official, male-dominated accounts of Islamic history. The empire reached its largest geographical limits under Harun, who received a diplomatic delegation from the first Holy Roman Emperor, to whom he sent an elephant as a gift. A number of medieval thinkers and scientists living under Islamic rule, many of them non-Muslims or heretical Muslims, played a role in transmitting Greek literature and Greek, Hindu, and other pre-Islamic knowledge to the Christian West. They contributed to making Aristotle known in Christian Europe. In addition, the period saw the recovery of much of the Alexandrian mathematical, geometric, and astronomical knowledge, such as that of Euclides and Claudius Ptolemy. These recovered mathematical methods were later enhanced and developed by other Islamic scholars, notably by Al-Biruni, and Abu Nasr Mansur, who are thought to have first derived the Cosine rule and applied it to spherical geometry. Three speculative thinkers, the Persians al-Kindi, al-Farabi, and Avicenna, combined Aristotelianism and Neoplatonism with other ideas introduced through Islam. Theological debate also took place. Significant debates include human free will versus predestination, the created or uncreated nature of the Qur'an and the relationship between God and God's attributes. Political interests were involved here, too. Those (the Mutazalites) who supported free will and a created Qur'an gave more scope to human reason. This appealed to several Caliphs, who supported the Mutazalites (813-847). The Asharites, named after Abu al-Hasan bin Isma'el al-Ash'ari (873-935), who argued in favor of an uncreated Qur'an, gave more scope to “revelation” and the traditions of Muhammad (the sunnah had greater authority than the Caliph, arguing that the Caliph was subject to the authority of the Sunnah). During the early Abbasid period, too, the hadith (sayings and acts of Muhammad, which constitutes the Sunnah) were collected and the four legal schools of Sunni jurisprudence were established. Ahmad ibn Hanbal (780-855) after whom the Hanbali School is named, was a great traditionalist who was imprisoned under Al-Ma'mun, who had instigated an inquisition (Mihna) (833-848). Al-Ma'mun sponsored the translation of works of Greek philosophy into Arabic. The Asharites triumphed and most Muslims asserted that it was now their duty to follow the rulings of the founders of the four schools, and not to innovate. This firmly established the principle that even the Caliph was subject to the law, not the maker of the law. In practice, Caliphs and the Sultans to whom in theory they delegated power, had the task of protecting the law and could do so in the form of decrees (qanun) that sometimes effectively by-passed it. Thus, in practice there was often competition between the temporal leader and those who saw it as their job to interpret the law. Since the temporal ruler was not trained in jurisprudence, the primacy of the law gave a great deal of authority to the professional religious-legal scholars. The high value that the above philosophers placed on reason, drawing on Aristotle especially, led to the charge that they had made revelation redundant. A reaction set in which some represent as the end of rationalistic philosophy in Islam. Al-Ghazali (1058-1111) roundly criticized the philosophers for paying only lip-service to Islam. Some consider the work of Averroes (Ibn Rushd) (1126- 1198) to be the last great example of theological and philosophical thought in Islam until the modern period, although this view is not shared by everyone. Hulagu Khan sacked Baghdad on February 10, 1258, causing great loss of life. Al-Musta'sim, the last reigning Abbasid caliphate in Baghdad was then executed on February 20, 1258. The Abbasids still maintained a remnant of authority, confined to religious matters, in Egypt under the Mamluks, but the dynasty finally ended with Al-Mutawakkil III. He was carried away as a prisoner to Constantinople by Selim I who defeated the Mamluks and claimed that Al-Mutawakkil ceded him the title and dignity of Caliph. This page was last modified on 2 February 2016, at 15:24.